Dislocated knee is a common injury which frequently occurs and may affect each and every person. In this medical condition the basic problem is actually related to dislocation of the patella (the knee cap), a bone which covers the front part of the knee joint. The dislocation is caused by sharp and direct blow to the patella. People who are suffering from knee dislocation will notice the weird appearance of the knee. Dislocation of the patella will lead to swelling and the knee will become highly unstable. The diagnosis can be set after physical examination of the patient. The X-ray of the knee is performed to rule out any serious damage to the patella. There are numerous causes of dislocated knee. The leading cause is forceful and crushing blow at the knee. Dislocation occurs in car accidents as well as bike accidents. Furthermore, the knee cap can be dislocated in case of knee twisting when the quadriceps muscles contract and additionally help in dislocation. Dislocation can also occur due to the direct hit on the knee. This happens in many contact sports. The problem with dislocation is that movable patella may cause repeated dislocations, if the injury is not treated properly. Repeated dislocations can lead to serious damage of the surrounding structures causing permanent functional problems. 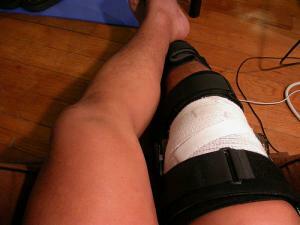 To minimize the movements and the pressure on the knee doctors commonly prescribe knee braces. The patients need to strictly follow doctor's orders and to rest in bed for certain period of time, in acute phase of the injury to apply ice or cold compressions on the knee and to elevate the injured extremity. The recovery time goes through two stages. The first stage includes protective rehabilitation. The goal of protective rehabilitation is to limit the injury and to successfully prevent further damage of the knee and surrounding structures. All the activities need to be restricted. This particularly refers to highly strenuous activities. The initial stage lasts approximately three to five weeks. The following stage includes strengthening of the knee muscles and re-establishment of its original function. The second stage lasts around two to four months. The physiotherapist is in charge with exercises which are applied. Physical therapy will strengthen the muscles and the normal flexion of the knee will be restored. The injured people are supposed to stay patient and not to be too pushy. They are also advised to gradually increase the strenuous activities because abrupt introduction of strenuous movements can result in re-injury. Treatment for Peraphal Neuopathy caused by trauma??? ?